The annual Long Beach to Dana Point Race is one of the most fun coastal races of the year and attracts a plethora of different yachts. From last years overall winner, Ed Feo’s “Loco.” to Seth Hall’s consistently raced J-124 “Marisol,” the fleet was stacked with good sailors. The wind was fluky and the racing was challenging. I was fortunate to be on Loco again and was excited about the prospects of doing well. The wind was not favorable to us but we worked hard to stay in the running. Marisol absolutely crushed and were very fast all the way around the course. We hung on for a tight third place and had some good code 0 sailing on the way. Check out the short clip below and scroll down to read more! Some of the Long Beach to Dana Point races have conditions that favor the big boats and sometimes conditions that favor the smaller boats. This year I raced on Steve Sellinger’s newly purchased SC-52 TRIUMPH. She was the biggest boat in this year’s race. Luckily, the light winds made this year’s race a big boat race. Good to be on the big boat! TRIUMPH started in Class A which was the 6th of 7 starts at 11:25. Class A had a mix of boats from the speedy RP44 Flaquita, the class 40 Yippee Kai Yay, J-133 Tango and two Farr 40’s White Knight and Temptress. At the start it could be any ones race, but Triumph crossed first at the pin end on starboard tack while the rest of the boats crossed her stern approaching the start line on port tack. YkY got caught on the high port lay line and had to do an evasive move to not foul the leeward Farr 40 or hit Triumph who had already started and was on the course side of the line. Light air from the south-southwest dominated the first hour of the race as the entire fleet tacked their way to the Angles Gate entrance before heading into the ocean toward the outer oil platforms Ellen and Elly. The stronger and more steady wind was on the right side of the harbor, not near the usual windier left side near the breakwater. Triumph and the J124 Marisol played the right middle of the harbor and exited 1st and 2nd in a close hauled course to the oil platforms. Headsail trimmers Daniel, Tom and Zach kept the sail in constant tightening and easing as the wind changed with coordinated effort with Phil on the main. The boat was moving great in the light air. For a few minutes, the wind kicked up and it seemed like the wind was going to keep building to over 10 knots, but once we sailed 20+ minutes away from the breakwater the wind went back to 7-9 knots. Very uneventful sailing, good time to have a sandwich and some chips. As Triumph approached the platforms, the wind did a slight increase in speed and slight change to the right (west) but only to 210 degrees. The choice of setting the code 1A or code zero was in debate. But, knowing we had a brand new code zero, the choice was obvious. The true wind angle (TWA) was positioned at 100 degrees, absolutely the sweet spot for the code zero. We hoisted and filled the sail and instantly felt the boat lean rail down and off we went to Dana Point. 9 knots of boat speed and 10 knots of wind, great angle, great pace to get finished before the wind slows or dies! The RP44 Flaquita had set a spinnaker and showed difficulty with holding course and boat balance in the puffs. Flaquita would have to bear away from course or have mini round ups causing them not put the heat on Triumph for a challenge for the lead. Grant trimmed the spinnaker with a few adjustments and Dale kept us up to date on the direct course to the finish line. Triumph was in great trim and decided to put up the genoa staysail for some extra speed and help the wind flow in the slot between the main and code zero. Ask any sailor if the staysail helps or not and you will get an overwhelming “yes” from each one! The person who notices the staysails benefit is the helmsperson. If the staysail is set and trimmed correctly, the helm will notice the boat tracks better and is more balanced with less movement and effort on the wheel or tiller. Get a staysail, it is a winner. In typical fashion, the wind dropped in speed as our race approached south Laguna and Dana Point. The wind was teasing us with slight changes in direction and puffs from 190-200 back to 220-230, but staying in the 7-9 knot range. The Triumph foredeck crew of Zach and Rochelle did a perfect spinnaker peel to the new Redline code 1A without dropping any speed or course heading to the finish. Very smooth. Not bad for the crew basically sailing together for the first time! 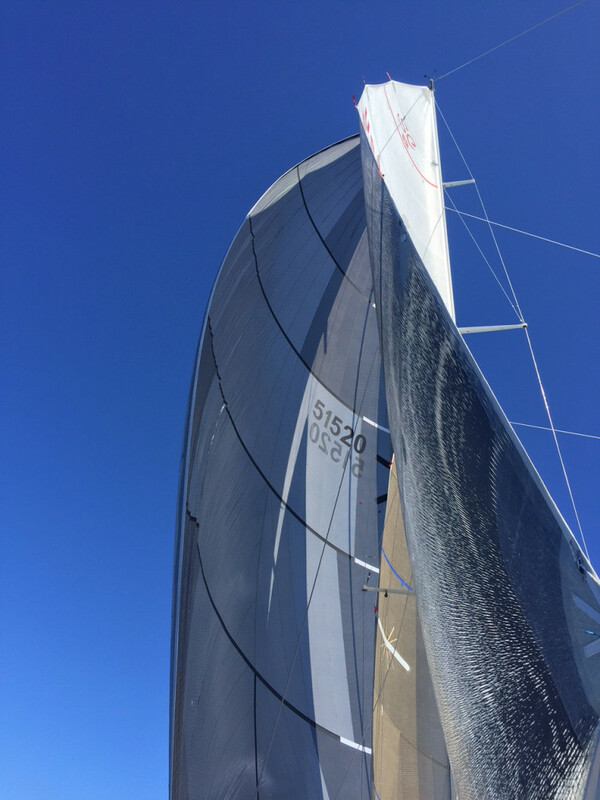 As Triumph picked up speed under the bluffs of beautiful Dana Point, the spinnaker pulled a bit harder and the chance for Flaquita to catch and pass us was not going to happen. Dale had Triumph lined up directly between the green finish buoy and the committee boat. Crossing the line 1st was very exciting to Steve and the crew of Triumph. It was the first time for a 1st to finish. Triumph lowered the spinnaker and make a turn back to Newport Beach for a late afternoon delivery back to Newport Beach for the Labor Day weekend. As we motored back up the coast, it was clear the wind was not picking up in the late afternoon which was making the chance for Triumph’s early finish to get a couple more first place’s for the race. I knew it was special to get that early finish and try to stay ahead of the smaller boats. Last year while sailing on the TP-52 Destroyer, we finished 1st across the line, 1st in Class A, 2nd Fleet overall…just 48 seconds behind the C&C 30 LOCO who placed 1st in Class B and took the 1st in Fleet Overall! This year however, the wind never came up for the fleet. This was definitely a big boat race, Triumph was able to finish in the best wind of the day and claim the top prizes this year! 1st to finish, 1st in Class A and 1st Fleet Overall.